(3).Robust performance. High signal quality. The insertion type ultrasonic calorimeter combines our high accuracy wetted ultrasonic flowmeter together with standard temperature sensors and computes the thermal energy transfer in a pipe accordingly. The insertion type ultrasonic calorimeter includes three parts: the main unit, the ultrasonic insertion type transducers, and the temperature sensors. 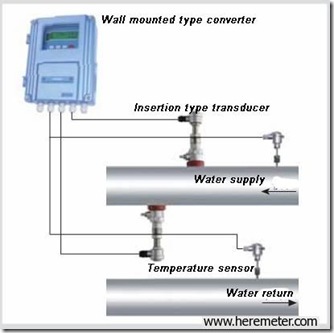 The main unit is a high-accuracy ultrasonic transit-time flowmeter. Its enclosure can be a standard version or an explosive-proof version. The ultrasonic transducers are wetted type (inserted installation) which provides better accuracy and long-term stability. The temperature sensors can be standard Pt sensor or customer-supplied sensor. The insertion type ultrasonic calorimeter can be used for accurate energy consumption measurement of a heating / cooling system in office buildings, apartment complexes, or any liquid-based thermal energy production system. It can also be used to monitor the efficiency of an energy production system such as HVAC installation. The insertion type ultrasonic calorimeter is designed for pipe size of 3" or above. For smaller pipe, please feel free to contact us for more details. 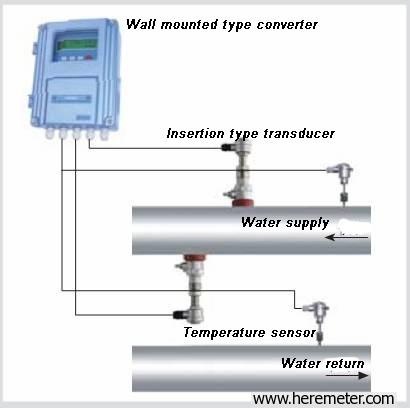 The main technical specificaitons are the same as that of insertion type ultrasonic flow meters.